This photo is of my 2nd-great-grandmother Anna Irwin taken in 1912. I chose this photo because it is one of only a handful of photos that come from my paternal grandmother’s family, so each is very precious to me. I have no photos of her husband, although I like to think he was taking this one. I love her outfit in this photo and the glimpse of the car and houses in the background. Anna was born in 1858 in Ontario, Canada to an Irish immigrant who had moved to Dayton, Ohio as a child then hopped up to Canada long enough to get married and have several children before coming home to Dayton. By 1880 Anna had married Edwin McKee of Dayton. 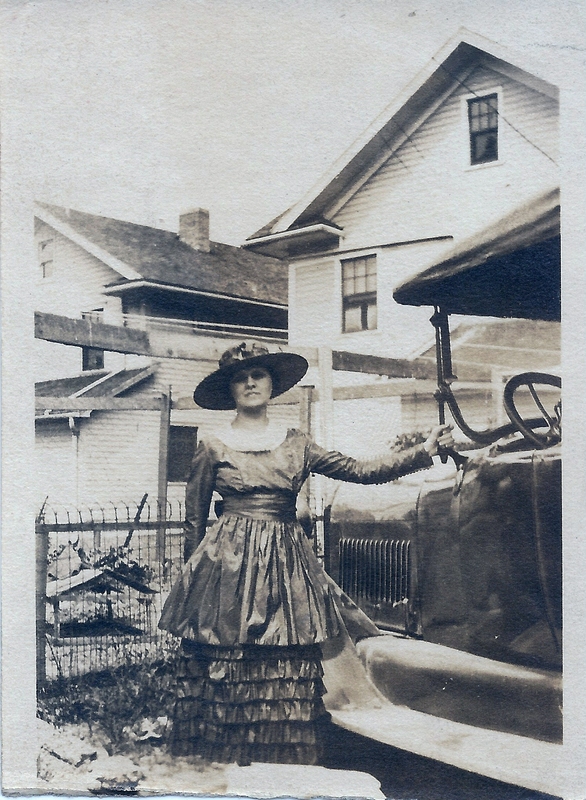 They lived in Dayton until Edwin’s death in 1925 and Anna continued to live with her unmarried daughter Lorena until her death in 1935 at age 77. Anna is buried at Woodland Cemetery in Dayton, Ohio with her husband and daughters.